Given the current financial woes at EMI, it is hardly surprising that the company has taken to delving into its recent back catalogue in search of marketable gems. Hence ‘EMI Great Classical Recordings’, a title that implicitly acknowledges that none of the material is yet old enough to market on its historical status. They will probably get away with it if they stick to recordings of this high standard. 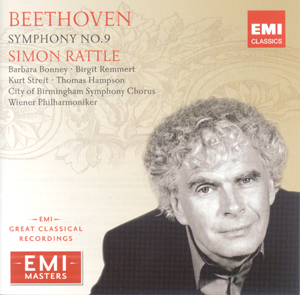 Rattle’s reading of the Ninth is hardly controversial, but has all the markings of a landmark of recording, history in the making. It was recorded in 2003 and was initially released as part of a complete cycle. It wasn’t the first Beethoven cycle to be recorded live, but that was still something of an innovation at the time. The other historically significant issue is the relationship between the conductor’s preference for period performance techniques and the orchestra’s more traditional approach. This was more significant in the recordings of the earlier symphonies, where the reduced vibrato and dry woodwind raised eyebrows. In the Ninth, he lets the orchestra have their way more, and the result is a more traditional approach, but with a handful of surprises thrown in. Of course, not even Rattle can please everybody all of the time when it comes to Beethoven, but most listeners’ expectations will be running high with a lineup like this: even the acoustic of the venue – the Vienna Musikverein – is widely considered to be the finest in the world. The combination of the VPO ensemble, the clarity of the acoustic and the high standard of the recorded sound makes for an elegantly textured sound, where the ear is endlessly drawn into the details of Beethoven’s orchestration. The audience is eerily silent throughout, coughs have perhaps been digitally doctored and applause is wholly absent. What is there to dislike about this recording? In the first two movements I can’t think of a thing that any listener could possibly object to, unless they are diehard authenticity nuts who think Rattle has sold out from his OAE days. The speed, or rather lack of it, in the adagio is likely to aggravate them more. Not me though, I love this Brucknerian approach, sustained, lyrical...sublime. In contrast, the tempos in the finale are often on the fast side. There is no danger of Rattle catching out the VPO players, of course, but he has them on the edge of their seats with speeds that are clearly a notch above what they are used to. I’ve nothing but praise for the quartet of singers and the City of Birmingham Symphony Chorus, though I wonder whose arm Rattle had to twist to organise that trip for them. The singing is clear and expressive throughout the finale, and the soloists make their chronically difficult ensembles sound like second nature. The edition used is the new Bärenretier Urtext, edited by Jonathan Del Mar. He sets contrabassoon an octave lower than we are used to in that flatulent interlude in the finale. Amazingly, it really works, injecting menace into the passage and wholly avoiding unintended comedy. The coda of the finale is probably the most impressive part of the whole recording. The structure of Beethoven’s finale has come in for criticism is some quarters, but Rattle demonstrates how it can really work. The joy is undiminished in this final passage, but the structural coherency and emotional depth of these closing phrases should be enough to dispel any doubts about Beethoven’s sincerity. If anybody reading does not own a recording of the Ninth Symphony (I know, that’s quite unlikely) then this budget price release is a must. Personally, I’d sooner listen to this than Karajan or Furtwängler, though I except I might be in a minority there. But if they are too extravagant for your taste and Norrington is too dry, then Rattle and the VPO might be just the compromise you’re looking for.